Matt C: The big one for me is, without a doubt, Strange Fruit #1. 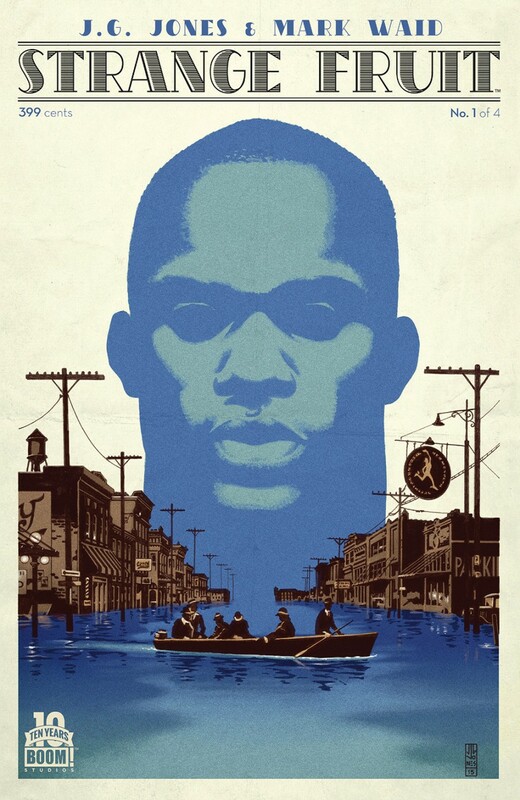 Taking it's name from the still-potent Billie Holiday song, it's set during the Great Mississippi Flood in 1927 when a fireball from the sky announces a 'strange visitor' who may change everything. A riff on Superman set in an era of striking racial divides? Could be, or that may be a red herring - we'll wait and see. What is clear is that the preview art from J.G. Jones has been pretty phenomenal, and as this book is being pitched as 'important', if you want a writer with the chops to bring depth and emotion to that label, Mark Waid (co-writing here with Jones) has proven himself repeatedly that he is one of the most versatile in the business. Potentially, this could be the real deal, a book we'll talking about for a long time to come. The other highlight in this week's crop of titles is Star Wars: Lando #1. The Star Wars comics Marvel have put out this year have been a mixed bunch, with the main series outclassing the others so far, but could we have another contender for pole position in the form of the smooth-talking ex-smuggler? Never count him out. His recent cameo in Star Wars Rebels showed he had an eye for the ladies and a way of manoeuvring himself out of trouble way before he arrived at Bespin. With Charles Soule and Alex Maleev in charge, this could easily win the day without having to cheat. Andy H: Secret Wars has had some 'interesting' tie-ins out over the last few weeks but this week sees a couple of titles that I have been waiting for. Civil War #1 is up first. On Battleworld the war between the Blue and the Iron has continued for years. It's going to be fun to see how the two sides have changed from that original concept in 2006 (yikes!). Charles Soule writes with dynamic art from Leinil Francis Yu. Possibly a little less intense is 1872 #1. As a self-confessed fan of Westerns I'm well up for this adventure. In the small town of Timely (like it), Sheriff Steve Rogers keeps the peace. The town drunk is a certain Anthony Stark and looking at the cover art it looks like an Old West version of Bruce Banner will be making an appearance too. Yee Haw! Also making the Secret Wars pull-list is Age Of Apocalypse #1, looking very retro indeed. Off to BOOM! Studios for the very worthy looking Strange Fruit #1. Written by Mark Waid and featuring the stunning art of J.G. 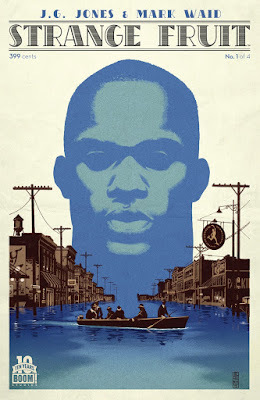 Jones this tells of the events of the Great Mississippi Flood of 1927. Boldly going off on a tangent I will try the possibly odd pairing of the Star Trek/Green Lantern crossover. Hey, it's set in space, it could happen! Also on a space theme we have the next Star Wars book. Lando Calrissian gets his own 5-part miniseries. Charles Soule and Alex Maleev bring us an adventure set before The Empire Strikes Back and Cloud City. Just how much of a scoundrel was Lando back then?